Find out all about about the local geology and landscape of Lochaber and about how the mountains were formed. 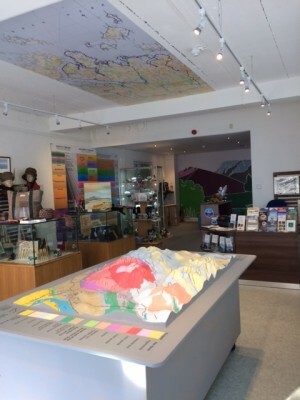 Our exhibits and displays include: Illuminated interpretation panels which tell the story of the geological processes that have shaped Lochaber. A large 3D scale model of Ben Nevis showing the geology of Ben Nevis and the surrounding mountains. Lochaber’s Timeline – colourful panels explaining the history of Lochaber’s rocks. A Mineral Cabinet Display showing lit minerals and fossils from Lochaber, Scotland and around the World. Our Video presentation screens show films about Lochaber: its history, culture, wildlife and geology. We also have a Childrens’ area where you can dig for fossils in the sandpit. It is an ideal place from which to start exploring the delights of Lochaber Geopark. With Christmas fast approaching why not drop in and browse our quality and locally produced handmade crafts all Made in Lochaber – you might just find the perfect gift. Our own Lochaber Geopark Ben Nevis Chocolates – yes they are in the shape of Ben Nevis, would also make that slightly different, interesting present for the discerning rock lover! We also have lots of books about local geology and the geology of Scotland.